We're still buzzing (or is that recovering?) from this summer's tour, at the same time as we're gearing up to come together again! After taking our tour far off into Montana and Idaho this summer, we're coming together again in Mount Vernon, Olympia, and Vashon Island, WA for a weekend of theater shows and community shows! 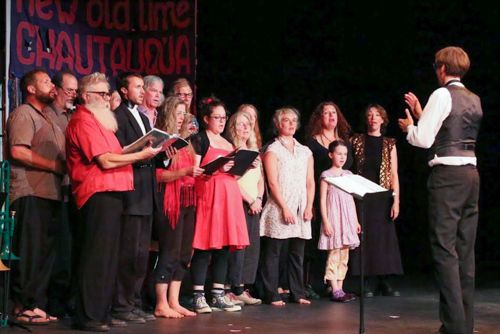 The Lincoln Theater (Mount Vernon) and Capitol Theater (Olympia) are regular venues for NOTC, and this will be our second visit to Open Space for Arts & Community on Vashon Island, which we hope to make a regular stop on our circuit. 2013's show at Open Space for Arts & Culture featured 6(!) Flying Karamazov Brothers! This time Open Space will feature NANDA & Mud Bay Jugglers, but the Ks will be in Mount Vernon and Olympia! 2014 Keep the Faith Tour! 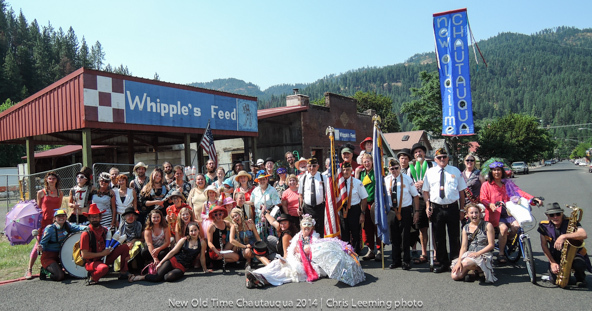 2014's summer tour honored the life and memory of Faith Petric, with a tour that visited her hometown of Orofino, ID, and a show that traced the history of the Chautauqua movement. We also created a museum exhibition that showed historical Chautauqua images and documents in each town. 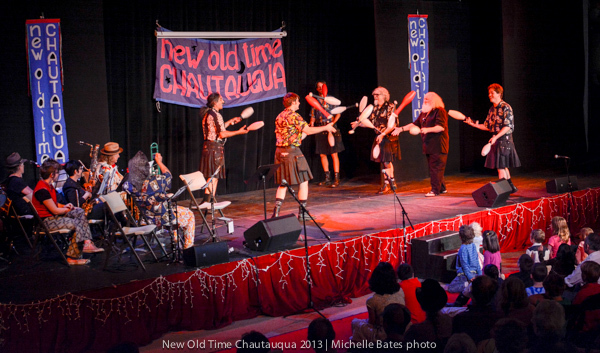 We "Chautauqua-ed" in a wide range of communities and venues, including the Kootenai-Salish, Pend d'Oreille and Nez Perce tribes.We had a wide range of community shows, at senior centers, prisons and a psychiatric hospital; and enormous community involvement in the parades and workshops. Check out the tour blog to get the play-by-play from the road and see photos from Libby, Eureka, Sandpoint, Hot Springs, Orofino and Spokane. Before the tour took off, a group of Chautauquans went to Darrington, WA to celebrate July 4th with the community around Oso, WA, which suffered a huge landslide earlier this year. We had a great time playing music, performing, and parading around town. Read Eben's report on the afternoon. Once again, we had the pleasure of joining with the Stillaguamish Tribe at the Festival of the River in Arlington, WA. In between our parades, workshops and shows, we got to enjoy the music the tribe offers, and we had the honor of parading into the Pow Wow arena to open the festivities. "The show in Libby was the best over-all performance at the Libby Memorial Events Center ever!! It made this old man feel young again!!!" Header photo of the 2014 Keep the Faith tour, by Chris Leeming.